1. 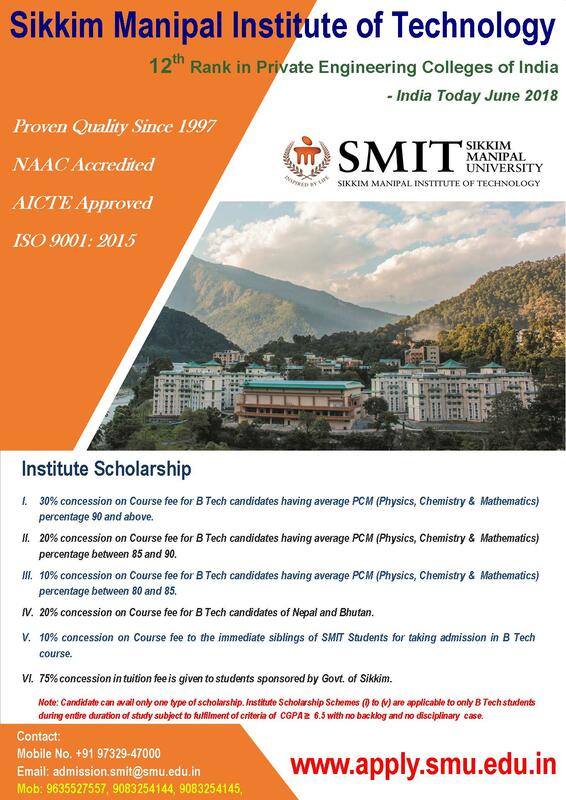 Applications are invited for Post Graduate admission to the following disciplines at Sikkim Manipal Institute of Medical Sciences for the academic session 2017 under General Category. *Subject to recognition by the Medical Council of India. 3. Selection will be based on NEET 2017 results for PG Admission. 4. Online forms available from 15th Jan 2017. 5. Last date of receipt of duly completed application form at SMIMS is 28th Feb 2017. 7. Please visit apply.smu.edu.in for filling up the application forms online. 8. Please attach a demand draft of INR. 600/- in favor of ‘Sikkim Manipal University’ payable at ‘Gangtok’ if the application form has been downloaded from the website.